Tackle those troublesome pests that can cause damage to your favourite plants! 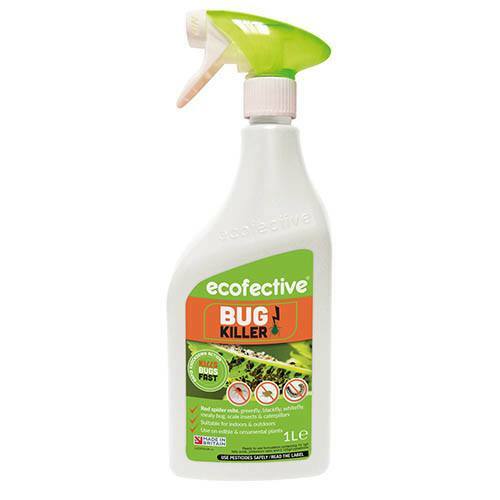 Use ecofective Bug Killer as soon as pests first appear on plants in your garden or under glass - use on roses, flowers, greenhouse plants, shrubs and trees, all edible crops including herbs, tomatoes, soft fruits, hard fruits (e.g. apples) and chillies. Formulated to eliminate Whitefly, Greenfly, Blackfly, Scale Insects, Caterpillars, Spider Mite and Mealybug from your plants, for best results spray pests and affected leaves thoroughly. A natural insecticide, ecofective Bug Killer has excellent dual-action, pest killing properties. Containing two naturally derived ingredients that work together delivering results first time on common pests, the unique combination of pyrethrum and fatty acids produce high levels of effectiveness to manage bugs like greenflies, spider mites, scale insects and caterpillars. Supplied as a Readu to Use 1L spray bottle. On contact gives control of Whitefly, Greenfly, Blackfly, Scale Insects, Caterpillars, Spider Mite, Mealybug and useful control of Thrips. Useful control of pests on roses, flowers, greenhouse plants, shrubs and trees, all edible crops to include herbs, tomatoes, soft fruits, hard fruits (e.g. apples) and chillies. When pests first appear both in the garden and under glass. As with all sprays, avoid open flowers and never spray in direct sunlight or in hot weather (when temperatures exceed 28°C). For scale insect control, apply several applications at weekly intervals to young stages following egg hatch (usually between June and August in outdoor plants). For other named pests, repeat application at weekly intervals as necessary. Spray pests and affected leaves thoroughly.